Thoughtful Logo: The letters, Tea Street, are inscribed on a pointed plate, designed to be a rendition of wooden signboards dating back to the dynasties of China. Sitting atop a lotus of tea leaves is a cup filled with boba and a straw that is a representation of the tallest building in Taiwan, Taipei 101. Made From Scratch: Tea Street’s craft drinks do not contain synthetically flavored powders or syrups. Fresh fruits and scratch-made syrups are used instead to provide depth and texture to the drinks. Tea Street, located at Colorado Blvd. and Mississippi Ave. in Glendale, is family owned and joins tradition and authenticity with contemporary tastes. As much thought and care has gone into the logo design and décor inside as it has with the tea they serve. The letters in Tea Street are inscribed on a pointed plate, designed to be a rendition of wooden signboards dating back to the dynasties of China. Above the signboard is Tea Street’s crest. Sitting atop a lotus of tea leaves is a cup filled with boba and a straw that is a representation of the tallest building in Taiwan, Taipei 101. 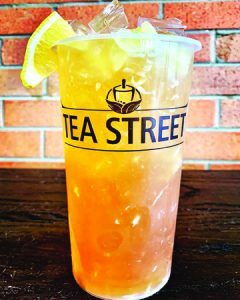 Building upon the foundation of invigoratingly bold brews of tea, Tea Street uses classic drinks as inspiration, with a modern twist. Their craft drinks do not contain synthetically flavored powders or syrups. Fresh fruits and scratch made syrups are used instead to provide depth and texture to the drinks. Syrups and toppings, including but not limited to puddings, herbal jelly, red and mung bean, and taro balls are made from scratch and rolled by hand. About 80% of all ingredients that go into their teas are made in their warehouse. Victoria and her brother Patrick grew up with parents who enjoyed drinking tea. Their parents imparted cultural significance in their background. 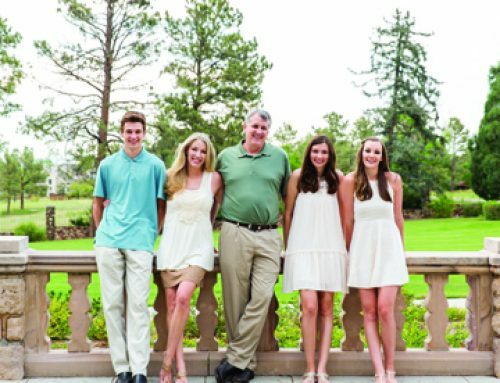 Their mom Chris is a Colorado native, but ethnically, she is Cantonese with significant Vietnamese cultural influence. As a child, Chris and her family frequently visited Hong Kong. Her Vietnamese born parents deeply valued their Chinese heritage and wanted to impart the significance of retaining their culture within Chris. It was during these trips that Chris was introduced to Hong Kong style milk teas. At a young age, she developed a love for this sweet, creamy delight. With each visit, her appreciation for the rich and bold brews of tea grew. Her adoration for milk teas eventually drew Chris to study abroad in Hong Kong. While in Hong Kong, Chris frequently visited Taiwan, where she was exposed to a different style of milk tea, the Taiwanese bubble tea. Hong Kong milk teas are typically served hot while Taiwanese bubble teas are served cold. Chris was exposed to bubble tea, also known as boba, on her many visits to Taiwan. The concept of bubble teas is to use premium tea, much like in Hong Kong, as the foundation for crafting various tea and mixed fruit drinks. Toppings, such as boba are then added to create an additional dimension of flavor and texture. The mixed tea is shaken and poured over boba or any other topping of your choice. Returning to the U.S., Chris felt a sense of detachment, after drinking milk teas almost daily for a year in Hong Kong and discovering bubble teas in Taiwan. She vividly remembered the taste, texture, and euphoria of drinking milk teas. Chris began brewing tea at home, mixing various fruits, milks, and toppings together. This self-experimentation eventually led to the beginning of Tea Street. Tea Street is located at 4090 E. Mississippi Ave. in Glendale. They share the same shopping center where Colorado Gold Mart, Smashburger, and Qdoba are located. For more information, call 720-863-8636 or visit www.teastreetdenver.com.